Obesity is a serious problem for people of all ages, but not all muscular kids have a weight issue. People with this body type are tall and thin. They may have difficulty putting on weight, no matter how much they eat. This body type is commonly seen in ballet dancers, basketball players, and marathon runners. Muscular kids may have a mesomorphic body type. They tend to be shorter than people with other body types, and build up muscle mass when they exercise. Losing weight may not be easy for mesomorphs, and they do well in power sports like softball or soccer. Endomorphs have a "pear shaped" body and find losing weight very difficult. Restricting calories through dieting only makes their metabolism slow down, which would have been a benefit in earlier times when food wasn't always plentiful. Think of athletes who participate in weightlifting or long-distance swimming for examples of this body type. Children who exercise regularly are able to deal with stress better than those who don't do so. They are able to focus on school work better, and kids who grow up being active are more likely to continue do so into adulthood. Muscular kids may appear to be overweight if you only consider the number on the scale, but this is not the case. Muscle is more dense than fat, and it also takes up less space. Eating well and participating in physical activity are good strategies for all children, no matter what body type they tend to have. They can develop endurance from participating in activities that raise the heartbeat. Aerobic exercise like basketball, soccer, swimming, or running help to strengthen the heart and build strong bones and muscles. Strength is built up by making muscles work against some type of resistance. 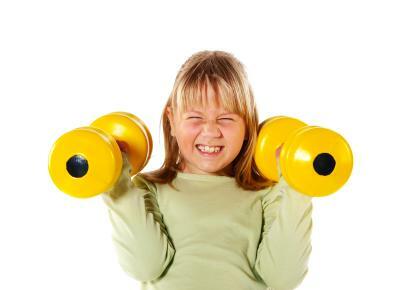 Adults may choose to lift weights to gain strength, but this may not be the best choice for children. Weightlifting should be closely supervised by a trainer or coach with experience working with youngsters. Kids can improve their strength by doing pushups, climbing on monkey bars, and similar activities. Any form of exercise that includes stretching will help children to develop flexibility. Muscular kids will benefit from activities that involve reaching or bending, such as martial arts training. The three body types, and variations of them, are all completely normal. Muscular kids may need to be reminded of the fact that if their parents or grandparents had a muscular build, their bodies may be built the same way. It doesn't mean that they have something wrong with them or that they have a weight problem that needs to be addressed. The focus should be on having a healthy lifestyle that includes eating a balanced diet and being physically active. Exercise releases endorphins, which are the body's feel-good hormones, and they help to create a positive outlook. There are many kinds of activities that muscular kids can participate in to stay fit. Find something that they can enjoy participating in regularly and they can learn to appreciate themselves the way they are.